It started as a hobby and grew into a 24-chapter 720-minute epic. But is it anime, or is it something else? The content of this 4-DVD set started life as an online comic created in Flash, and by the time it was completed, the creators had been working full-time for 3 years on the project. For this DVD release, not only have the graphics been updated, professional voice actors have been called in to voiceover the characters, the sound has been completely remixed into 5.1 format, and the result is unique. 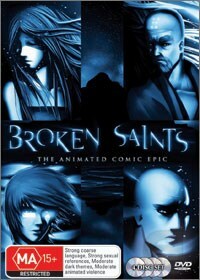 As a flash-based web comic, Broken Saints won a number of awards, and I would have to say that it deserved its kudos. There are few mass entertainment examples with the thematic depths of this story. Philosophy, Religion, Politics, and Spirituality are explored in this complex tale of faith, conspiracies, and Armageddon in a high-tech world. There is enough depth in this show that you could watch it a dozen times and get new things out of it every time, and that's incredibly rare in any form of mass media. But it's not very animated; the visuals are mostly still images, with animation used to segue between scenes. So is it anime? Another way in which the unique origins of this ...(fumbling for a suitable term here)... presentation... enable it to go beyond the usual restrictions is in the length of the chapters. Like the chapters in a novel, or a piece of string, these can be as long as they need to be. They start off reasonably short in length, and in general grow longer as the interwoven threads of the plot surrounding the four central characters begin to splice together. Many of the chapters contain two or three acts, and the final chapter is a massive 83 minutes in length, consisting of 5 acts plus a prologue and epilogue. This can take some getting used to, and means that you will almost certainly never see this series on your television screen; it's simply not scheduling-friendly enough. Is this the first example of a new concept - the made-for-DVD series? Or just a unique aberration? One of the penalties of starting out cutting-edge in any technology on a project with this long a life-span is that the technology, and the appreciation of what you can do with it, advance while your story progresses. That means that either you upgrade with the technology, remaining at the forefront of what your technology can do, or you aim for consistency by staying with the same (ageing) tools and techniques. In other words, either your early episodes look dated or your whole storyline does. But by re-doing significant quantities of the work when compiling the project into the DVD format - in this case, extensively redoing the artwork in the first several chapters - this project brings to light a third answer, and one that means that there is something new for those who were fans of the original internet presentation. Speaking of the sound, that deserves a special mention as well. This is a blend of original score and sound effects and classical pieces from composers such as Mozart, and (as with the use of Flash), used cutting edge digital compositing techniques. These methods have since become mainstream tools - the Lord Of The Rings trilogy handled its sound in a similar way - but there is an adventurousness here that the more refined product lacks. The downside is that there is also a sense of rawness of technique at times. Again, with so much of the sound redone for this DVD presentation, the results are a blend of sophistication and innovation. So important to the finished product is the soundscape that the creators at one point in the extras package quote a George Lucas comment that movies are "50% vision and 50% sound" before commenting that in the case of Broken Saints the ratios are more like 30 - 70. It wasn't all good. The menu takes what seems like FOREVER to present you with options; the pre-menu presentation feels like it takes minutes. I was actually beginning to wonder if the menu system on the DVD was broken, it took so long. I've deducted a point from extras just for the sheer annoyance it caused. The storyline is very complex and deeply woven, which means that the plot seems to drag a little in the first half-dozen episodes while characters and setting are being established. That cost the feature a point. There was a strong temptation to skip ahead to a later chapter to facilitate this review (or in the case of the general audience, to get past the slow stuff); resist this temptation for all you're worth. Each chapter builds on what has gone before, and you'll lose a lot of the impact and depth of what comes later if you succumb. This is not a straightforward action-adventure flick or commonplace TV series where you can hop in after the first ad break and not miss much; this is deeper and requires a little more investment in time and attention from the viewer if you are to get the most out of it. In general, if you're the type of viewer who likes plots with a bit of substance, or who wants a series that is cool in a completely different way to anything else out there and isn't afraid of a few hard-to-digest complex questions, then this package is an excellent choice. Fans of 24, Alias, X-files, Lost, or Jericho who also watch anime should be queuing up to buy copies if they don't have them already. If you prefer Slayers or the Powderpuff Girls, this may be over your head - or deeper than your interest. In which case you should borrow a copy from a friend and see just how far your mind will stretch if given the chance. Oh, one final word of warning - you should not let children watch episode 19.